On July 4, 1054 A.D., Chinese astronomers noted a "guest star" in the constellation Taurus; Simon Mitton lists 5 independent preserved Far-East records of this event (one of 75 authentic guest stars - novae and supernovae, excluding comets - systematically recorded by Chinese astronomers between 532 B.C. and 1064 A.D., according to Simon Mitton). This star became about 4 times brighter than Venus in its brightest light, or about mag -6, and was visible in daylight for 23 days. Some older sources had speculated that this supernova might have been as bright as the Full Moon (or mag -12). The reason for this assumption was probably the intention to fit its 23-day visibility with older model lightcurves. It was probably also recorded by Anasazi Indian artists (in present-day Arizona and New Mexico), as findings in Navaho Canyon and White Mesa (both AZ, found 1953-54 by William C. Miller) as well as in the Chaco Canyon National Park (NM) indicate; there's a review of the research on the Chaco Canyon Anasazi art online, including the full-size version of our photo, which was obtained by Ron Lussier. 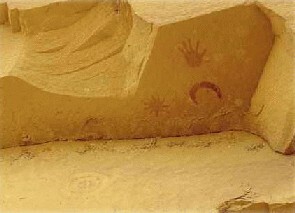 A similar photo of this possible Supernova Pictograph was obtained by Paul Charbonneau of the High Altitude Observatory. As Simon Mitton points out in his book (Mitton 1978), evidence for the plausibility of this interpretation arises from the fact that on the morning of July 5, 1054 the crescent moon came remarkably close to the supernova, as seen (only) from Western North America. In 1990, Ralph Robert Robbins of the University of Texas announced the discovery of additional records in pottery of the Mimbres Indians of New Mexico. The plate probably representing the supernova is e.g. shown on page 68 of Robert Garfinkle's book Star Hopping. As the author lines out, the art style of this plate was used only before 1100 A.D., and carbon-14 dating indicates that this plate was created between 1050 and 1070 AD, so that very probably the supernova is depicted, as a 23-rayed star. Strangely enough, it seems that at least almost no records of European or Arab observations of the supernova have survived to modern times. According to Burnham, the Chinese records were translated by J.J. Duyvendak (1942; also quoted by Mitton): ".. In the 1st year of the period Chih-ho, the 5th moon, the day chi-ch'ou, a guest star appeared approximately several inches south-east of Tien-Kuan [Zeta Tauri]. After more than a year, it gradually became invisible .." It is this date which is July 4, 1054 AD. Burnham speculates that the term "inches" may indicate that the position was taking on a celestial globe or armillary sphere, and not in the actual sky, which may explain the "wrong" direction, as in the heavens, M1 is situated north-west of Zeta Tauri. Mitton points out that "inches" refer to an angular distance of about 0.1 degrees, and "several" is typically used for a number between 3 and 5, so that the separation mentioned probably corresponds to 0.3 .. 0.5 degrees. A later reference [in Sung hui-yao by Chang Te-hsiang], according to Burnham and supplemented by Mitton's quote, states: .. On the day Hsin-Wei [April 17, 1056] the third month in the first year of the Chia-yu reign period [March 19 - April 17, 1056] the Director of the Astronomical Bureau said, `The Guest Star has become invisible, which is an omen of the departure of the guest'. Originally, during the fifth month of the first year of the Chih-ho reign period, it appeared in the morning in the east guarding T'ien-Kuan. It was visible in the day like Venus, with pointed rays in all four directions. The color was reddish-white... It was seen altogether for 23 days [as a daylight object]. These two dates, July 4, 1054, and April 17, 1056, indicate that the "guest star" was visible to the naked eye for 653 days, at least from China. Yang Wei-Te, Chinese court astronomer/astrologer in those days, reports that in its first two months, the star was of yellow color. The date of the occurrance of the supernova 1054, July 4, has repeatedly been questioned on various occasions, as it might have been that the Chinese observers may have missed the very first days, e.g. due to weather. A Japanese source (the poet Sadiae Fujiwara about 1235 AD) shifts this date to as early as May 29, but on this day the star Zeta Tauri, which is mentioned in this report, is still too close to the sun to be observable. In 1997, Giovanni Lupoato, in his book SN 1054: Una Supernova sul Medioevo, (see e.g. Steven N. Shore's article in Mercury Vol. 29, No. 2, March/April 2000, p. 9) mentions perhaps the only preserved possible European record of this event, a somewhat dubious manuscript called Rampona Chronicle, preserved only in a 15th century transcript. He speculates that in the date given, 24 June 1058, there might be a transcript error of "MLIIII" (1054) to "MLVIII" (1058), which might indicate a date of 24 June 1054 for this event. For a recent review of the research for the exact date of SN 1054, see e.g. the Collins II et.al. (1999). Still, the present author thinks that best evidence for the supernova event date is still that given in the Chinese records, July 4, 1054. The Supernova 1054 was later also assigned the variable star designation CM Tauri, a designation which is sometimes also used for the (optical) Crab pulsar. It is one of few historically observed supernovae in our Milky Way Galaxy. The remnant of this supernova is the famous Crab Nebula M1.